Submitted by David Farbman on Tuesday, August 11, 2015 - 15:54. Every so often in the field of education research a study comes along that challenges some basic assumptions about the way that schools and school systems operate. 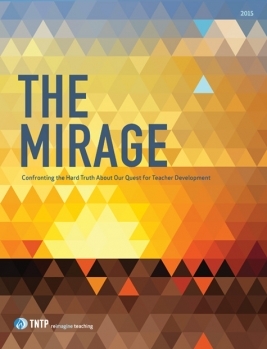 Such is the case of a new report released by TNTP entitled The Mirage: Confronting the Hard Truth About Our Quest for Teacher Development. In setting out to answer a core question in education—do we know how to help teachers improve?—this new piece of research ends up raising serious doubts about how we typically endeavor to improve instruction and raise achievement. As part of the investigation, researchers consider how much time and money is spent on all forms of professional development in three large urban districts and a mid-sized charter management organization. Even more important, the research seeks to uncover the associations between the ways in which teachers spend their time trying to improve their instruction and their performance as educators. no common threads that distinguished ‘improvers’ from other teachers. No type, amount or combination of development activities appears more likely than any other to help teachers improve substantially, including the “job-embedded,” “differentiated” variety that we and others believed to be the most promising. As we detailed in Time for Teachers last year, how teachers spend their time learning really does matter. In particular, peer observations can have an enormous impact on altering teaching routines for the simple reason that watching one’s peers in the next classroom over connects so directly to teachers’ own practices and the conditions in which they work. This potential for significant impact is the reason we’ve coached so many schools to build in repeated opportunities for teachers to observe their peers. Unfortunately, though, as the Mirage report reveals, those opportunities are in too many cases too infrequent and uncoordinated to have any real impact. And so I would entirely agree with the report’s conclusions—conclusions that mirror our own in Time for Teachers and that we seconded by signing onto a letter from Learning Forward reacting to the report—that school districts thoroughly reconsider how they organize and deliver professional learning for teachers. As the Mirage authors learned, the schools that seem to be having the greatest influence on teacher practice are those in the charter management organization because those schools emphasize the importance of fostering a learning culture for teachers (not only for students). As NCTL continues to work with schools to help administrators and teachers create the conditions where professional learning is valued and pursued aggressively, we hope that this new study will persuade others to follow the same path toward stronger instruction and better learning for our kids.